It’s surprising just how often people discover items of historical interest in the walls of their properties. Today’s accession arrived in the Archives as a result of renovation work going on in a house in Mill Street in Deseronto. Grateful thanks to Shelley Dupont for bringing them in! Three items were found inside a wall of the house. The first is a photograph of an unidentified family. The picture has suffered some damage from being inside the wall for perhaps 100 years, but the image is still fairly clear. There is nothing on the back of the photograph to identify the group. 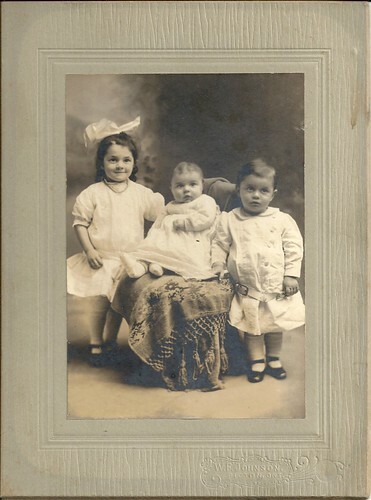 The second photograph has more information – these three children are identified as Hazel Annie Cole, aged 3 years and 5 months; Murney Nelson Cole, aged 1 year, 9 months and Edna Kathleen Cole, aged 6 months. Hazel was born July 27 1910 in Milford, Prince Edward County – dating the picture to late 1913/early 1914. Their parents were Jesse Abbot Cole and Alta Theresa Viale. The third item also has a Prince Edward County connection. 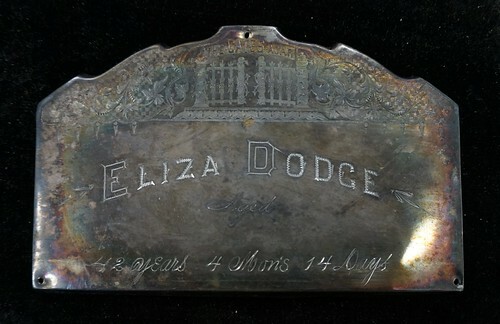 It is a wooden rectangle, covered with black felt, and with a tin plaque, bearing the name of Eliza Dodge. This is a coffin plate. Eliza died in South Marysburgh on March 1st, 1890. Annie Cole is the link between the last two items: she’s Eliza’s daughter and aunt to the three Cole children. Perhaps the first photograph has a Cole family connection, too? Claude and Jesse came from a family of four sons and one daughter, which just happens to be the configuration of the family in the first photograph. We’re entering into the realms of wild supposition here, but it’s just possible that this photograph represents Simon Aylsworth Cole (1844-1922), his wife Sarah Letitia Boulter (1848-1922) and their five children: Claude (1870-1938), Edna (1873-1929), George (b.1876), Arthur (1877-1941) and Jesse (1879-1937). If so, it would have been taken in around 1885. Or they could be other people entirely! UPDATE (Feb 15th, 2014): Thanks to Claudia (Cole) Grendon for adding some more details to this story in the comments. She tells us that Annie Cole was her grandmother and that Annie moved to Mill Street in around 1939 with her son, Wilmot Havelock Cole and his family. She died in around 1946 and (additional information from Tammy Cole Peterson) was buried in Glenwood Cemetery in Picton, where her husband, Claude, had also been laid to rest. Thanks for commenting, Claudia! That rounds the story off nicely – it looks from the records as though your father, Wilmot, was the only child of Claude and Annie Cole, is that right? Do you know when they moved to Deseronto? no there was another brother Cecil who passed away in 1942 as well . we moved to Deseronto approxametly in 1939 & Gramma Cole ( Annie ) lived with us until she passed in 1946 or 1947 . I have discovered that Claude and Sarah (Annie) are both buried at the Glenwood Cemetery in PEC. 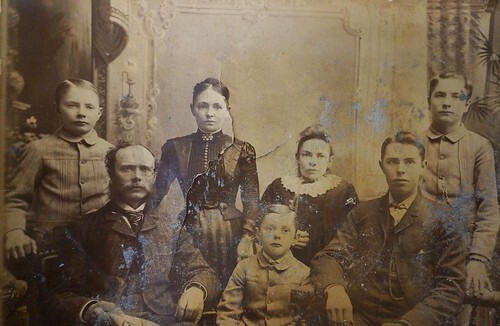 I also related…they are my great grandparents. Thanks for that information Tammy. We’ve added it to the blog post. I too am an ancestor to this Milford group…. I am the great granddaughter of Frederick Dodge… my grandmother was Rosa Bell Dodge… I am in possession of a very large and old photo album… that belonged to her mother. I have many pictures of the Coles, Wellbanks, Clapps and Dodges and many of whom I do not know..at one time my mother ask family on that side who the pictures where of and by their memory the name was written on the back of the photo. I would love to be able to confirm or share with people looking for pictures of their relatives. I was interested in scanning them and forwarding them to whom ever is interested. I am in the United States Washington state. Judy Morrissey (Striker) Rosa Bell Dodge son Claude Frederick Striker my father.